Staff was professional and very helpful. The location was very good, though you needed to walk a little to any attraction. Everything else was excellent. - Rooms were in good condition. - Beds were comfortable. - Sofa bed was also comfortable. - All the appliances kept were well thought out. - Excellent location. - Helpful staff. Big room for Paris, kitchen, really clean for Paris. Our room had great arrangement of room, we even had small entrance room, so we did not hear sounds from the hall. Great hospitality and nice and quite apartment style hotel. If you are looking for bigger space for the apartment, this is the one. It is an excellent option for people staying with children, there's a great bakery next door and a quite large supermarket. There are great restaurants around. It is a bit far if you want to visit touristic Paris attractions but there's a direct bus going thru Trocadero to Opera. It feels like renting an appartment but they come in to clean. The elevator is tiny but works. We didn't need anyhting so I didn't have any interaction with the management but they emailed asking if everything was alright and I aprreciated that. It was nice to have a living room and kitchenette separate from the main bathroom. We also enjoyed the fact that the neighborhood was quiet and away from tourists and gave us the feeling of living like locals. There is a wonderful bakery around the corner and a supermarket that provided us with provisions during our stay. Overall a great place and value for our week in Paris. i liked that one bathroom was bigger than the other and that both was spotless! Had a great time in the shower. The location was brilliant. Easy walking distance to various places. Very conveniently situated. It was spotless. Staff were helpful when we wanted to book shows. 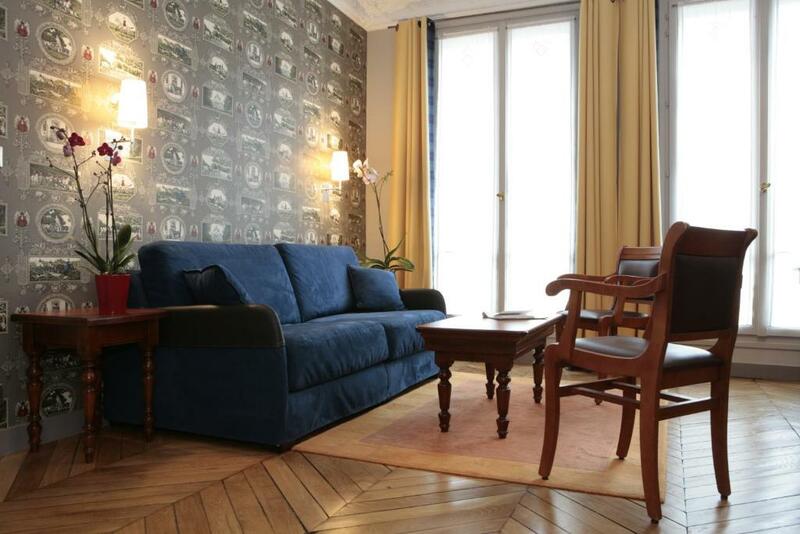 Lock in a great price for HotelHome Paris 16 – rated 8.5 by recent guests! HotelHome Paris 16 is located in Paris’s 16th arrondissement, 0.9 mi from The Bois de Boulogne. It offers air-conditioned, self-catering apartments with free Wi-Fi internet access. 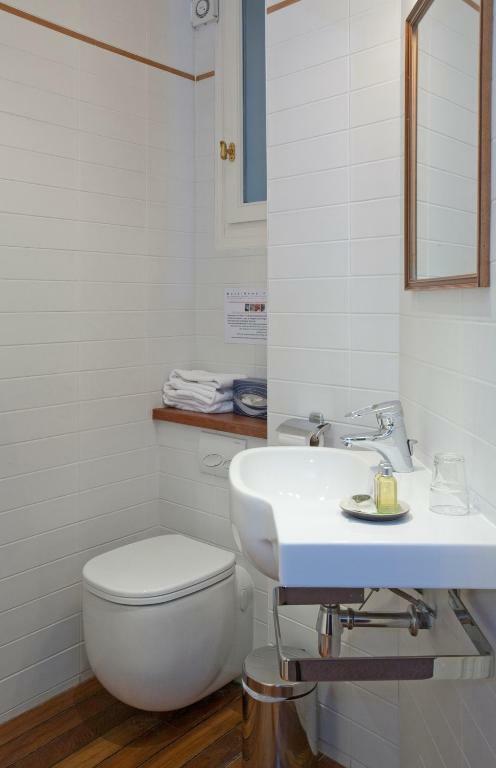 The apartments at HotelHome Paris 16 have a seating area with a satellite TV and either a kitchen or kitchenette with a microwave, fridge and kettle. 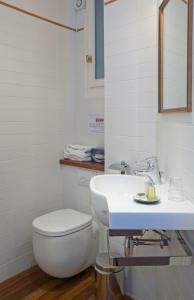 Apartments also feature a dining area and a modern private bathroom with a bath or shower. 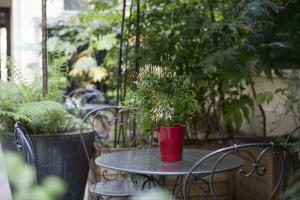 Guests are invited to enjoy this aparthotel’s garden and terrace during their stay. There is also a laundry in the basement of the building. Reception staff at the hotel are available to organize babysitting services and make reservations for dinner and sightseeing. HotelHome Paris 16 is 1,000 feet from Jasmin Metro Station, which offers direct access to the Eiffel Tower and the Champs Elysées. The Seine River is 2,650 feet away and the Parc André Citroën is a 20-minute walk from the hotel. 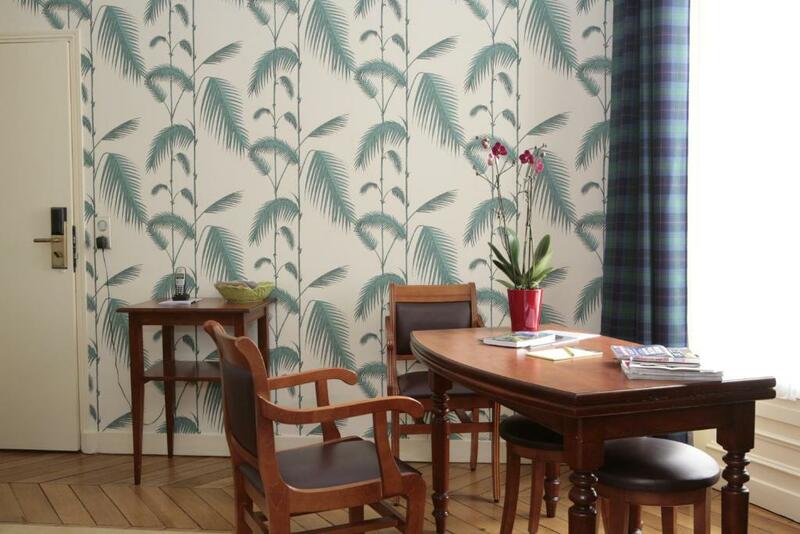 When would you like to stay at HotelHome Paris 16? This apartment has a separate bedroom, lounge and kitchen. It is also accessible with an elevator. This apartment has a separate bedroom with fireplace, kitchen and a spacious lounge with a sofa bed. This apartment has 3 bedrooms overlooking the interior courtyard. There is a second bathroom, living room and kitchen. On the 2nd or 3rd floor, this suite has a bedroom and a living area with a kitchenette. It is only accessible by a staircase. Please note that these apartments are on 3rd or 4th floor without elevator. This apartment has a kitchenware, cable TV and seating area. This apartment features a kitchen, oven and dining area. This apartment features a dining area, cable TV and air conditioning. HotelHome offers 17 apartments : - 5 apartment "Junior Suite" of two rooms with one bedroom of 30 m², for up to 3 persons, accessible by staircaise from the ground floor to the fourth floor, - 5 apartments "Twin Suite" of two rooms with one bedroom of 35 m², accessible by lift, from the first to the sixth floor, - 5 apartments "Suite Double" of two rooms with one bedroom of 45m² , accessible by lift, from the first to the fifth floor, - only one apartment "Family Suite" of three rooms with two bedrooms of 60m², accessible by lift and located at the sixth floor and - only one apartment "Family Suite" of four rooms with three bedrooms of 65m², accessible by loft and located at the fifth floor. The building is typically Parisian Haussmann, with two apartments per floor. 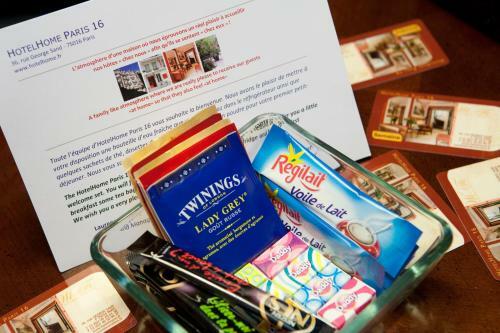 In the apartment, you will find a welcome kit containing what you need to prepare an herbal tea before going to sleep or breakfast in the morning (coffee, milk, teas bags, orange juice, cereal cookies, sugar and mineral water). In the bathroom or shower, enjoy the hospitality products L'Occitane to soften your evenings or invigorate your mornings ! A bathrobe is also available for longer stays. We chose to buy thisapart-hotel in 2002 because we like to welcome and receive our guests not only as customers but as friends. We love to make their stay pleasant and comfortable in a very friendly atmosphere. 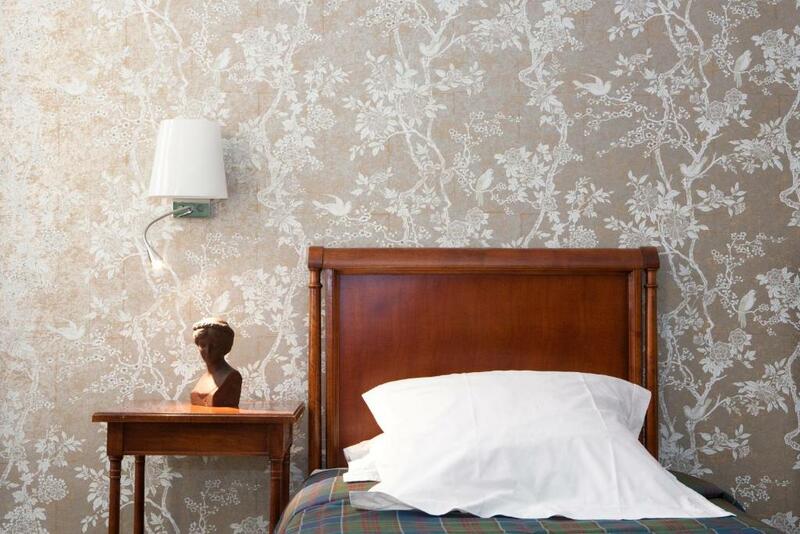 We appreciate that our guests feel at home at HotelHome Paris and they too! 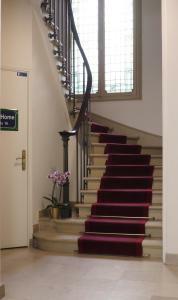 Welcome, we look forward to receive you soon and will of course do our best to make your stay in Paris pleasant and comfortable. Choosing HotelHome Paris 16 is choosing a helpful staff, unique apartments, and a team at your service. Your stay will earn in quality. HotelHome is the heart of the Auteuil district, a district of western Paris very pleasant, quiet and residential, well connected to the center of Paris by metro and bus. You will enjoy the charm of Paris in this very peacefull area. HotelHome Paris 16 is a pleasant residence, situated in the heart of a welcoming and residential district of Paris, quiet and elegant, close to the Eiffel Tower, the Roland Garros tennis stadium, the Auteuil and Passy boroughs and the Bois de Boulogne. The Champs Elysees and of course all the main tourism and culture spots of Paris are easily accessible by metro (Jasmin - line 9 or Michel-Ange/Auteuil and Michel-Ange/Molitor - line 10), RER (Boulainvilliers - Line C) or bus (lines 22 and 52). Area Info – This neighborhood is a great choice for travelers interested in shopping, romance and restaurants – Check location Great location - show map Guests loved walking around the neighborhood! House Rules HotelHome Paris 16 takes special requests – add in the next step! HotelHome Paris 16 accepts these cards and reserves the right to temporarily hold an amount prior to arrival. If you plan to arrive later than 18:00 or on a weekend, please contact the hotel in advance to obtain the main door access code. To ensure you have some provisions when you arrive in your apartment, email the residence a list of any food or drink that you would like and staff will be happy to go shopping for you. Please note that the an ID/passport and the credit card used to make the reservation will be requested upon arrival. Please note that, when paying with an American Express card, a 3% extra fee will be charged. Parking spaces can be reserved in advance by emailing the property. 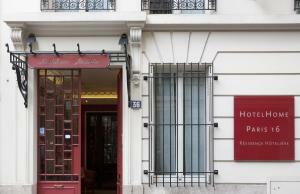 Please inform HotelHome Paris 16 of your expected arrival time in advance. You can use the Special Requests box when booking, or contact the property directly using the contact details in your confirmation. Kitchen pretty basic (and lots of fake wood). Problems with shower room (see above). No overhead shower spray. Comfortable beds and very good standard of housekeeping (every day except Sunday). Quiet location. Good heating and hot water. Good transport (bus and metro) to central Paris. Spacious accommodation. Twin beds as requested. Plenty of storage space. Some problems - no-one at reception when we arrived, although we arrived at a time when the office was meant to be open. Plastic chipped off shower head, and middle shelf (on fake wood storage unit in shower room) missing. Stains on carpet between bedroom, shower room and living room. The lift is to small, so it tajes time to bring the lugage to the 5th fl. Small plastic water bottle in minibar Euro 3,00. Very nice place, excelent location. Beds need to be renewed because they are noisy and uncomfortable. Very nice neighbourhood, clean neat apartment, bigger than most, reasonable price . Excellent communication with host. We asked for more bathtowels and did not get them the next day. Also, the microwave was not working due to the rotating board inside. The location was very convenient, a calm neighbourhood. There were several supermarkets and metro stations nearby. The hotel has a nice public courtyard for their guests. The room itself was big enough and was clean-ish. The front desk is not open on Sundays and it would be helpful if it was open for a few hours, especially during checkout time. The hotel reserved a taxi for us and the driver to the airport charged us double what the hotel said it would cost. This took a toll on our budget and we lacked money for food and parking. If the front desk would have been open, we could have had assistance and cleared up the price. I advise the hotel to not use that taxi company anymore. We are frequent travelers and this apartment was hands down one of the best places we have stayed. The location was clean, safe, full of charm and easily accessible to metro/RER. We had a courtyard view and one bedroom window view of the Eiffel tower. It was so quiet we could hear a pin drop. I've never slept so well. 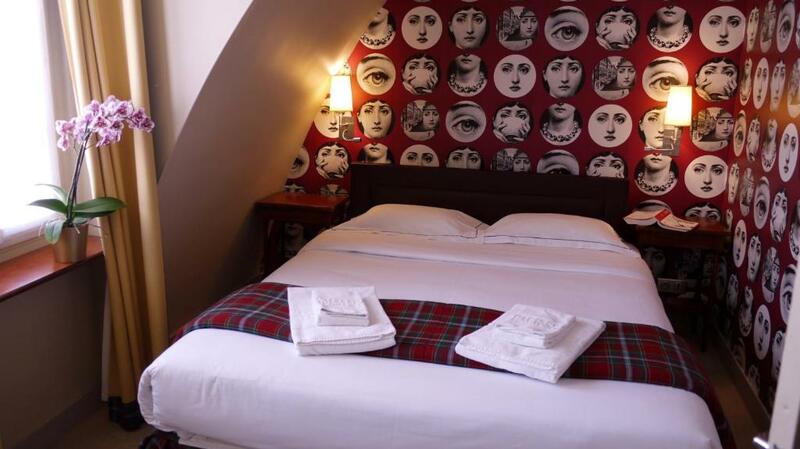 Our beds were made each day, the building is secure with a code to get in, full of lovely décor and just an all around amazing place. I was given a survey before our arrival to meet all of our needs. That was very impressive, I really felt the hotel had full interest in making our stay the best possible. The communication from the hotel was impeccable. I was truly pleased. Long search for ironing equipment. Called reception where to find, nobody there. Afterwards receptionist told it was under the bed, hidden behind curtains... At departure we did not know where to leave the keys of parking and cards of rooms. Again at 08:30 nobody at reception. We left them in a strange way.